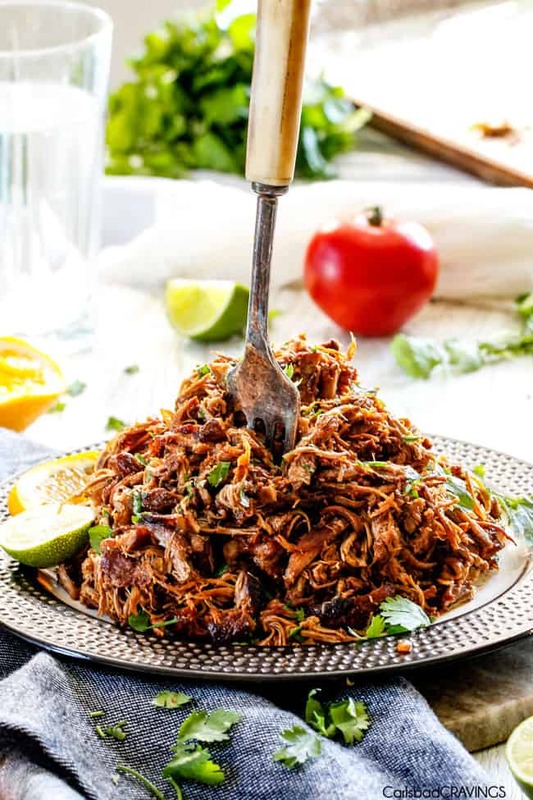 These are the BEST Pork Carnitas (Slow Cooker Mexican Pulled Pork) you will ever try! Or so say all the reviews! Your search for the Best Pork Carnitas Recipe stops here. These Slow Cooker Pork Carnitas are super juicy, easy and so much more flavorful than other versions complete with glorious caramelized crispy burnt ends! They are great for large crowds or make ahead meals and makes the best tacos, burritos, nachos, salads, etc. Pork Carnitas!!! Whenever Patrick and I frequent Mexican restaurants here in San Diego (or more accurately hole in the wall joints – the best), one of us usually ends up with Pork Carnitas Street Tacos. The crazy tender juicy pork shoulder with addictively crispy edges is hard to beat. And now we can all devour them at home! Carnitas are more mild in flavor than my intensely flavored Slow Cooker Barbacoa Beef which make them incredibly versatile for anything and everything you want to make with them and go pair fabulously with my Homemade Salsa Recipe, Salsa Verde and Pico de Gallo! They also make a fabulous base if you want to “get saucy” and stir in some enchilada sauce, salsa and a touch of brown sugar at the end of cooking. 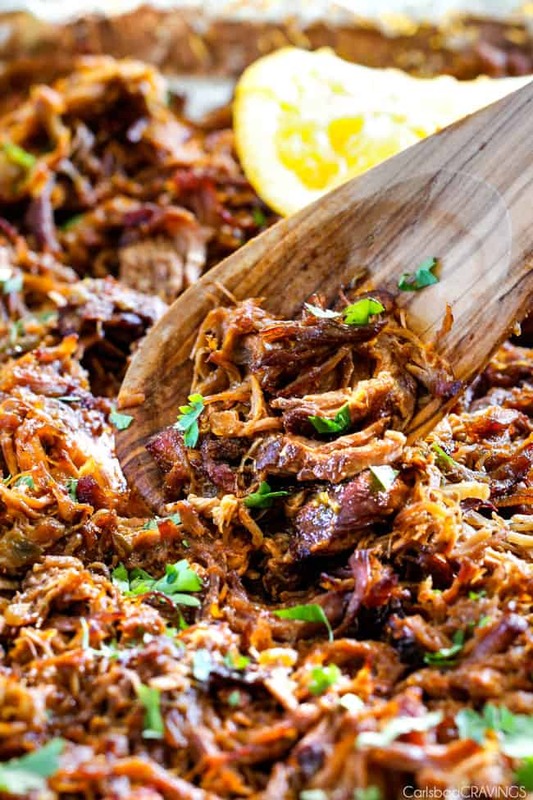 But more than likely, you are going to want to devour these Crockpot Carnitas just. the. way. they. are. While Carnitas are traditionally made by simmering large chunks of seasoned pork in hot lard on the stove top then coarsely chopping to achieve the name Carnitas, translated as “little meats,” virtually the same result can be achieved in the slow cooker then baking and broiling the meat once shredded to achieve the crunchy bits. Some might call this method blasphemy, but I call it easy, smart, healthier, and absolutely scrumdiddlyumptious. 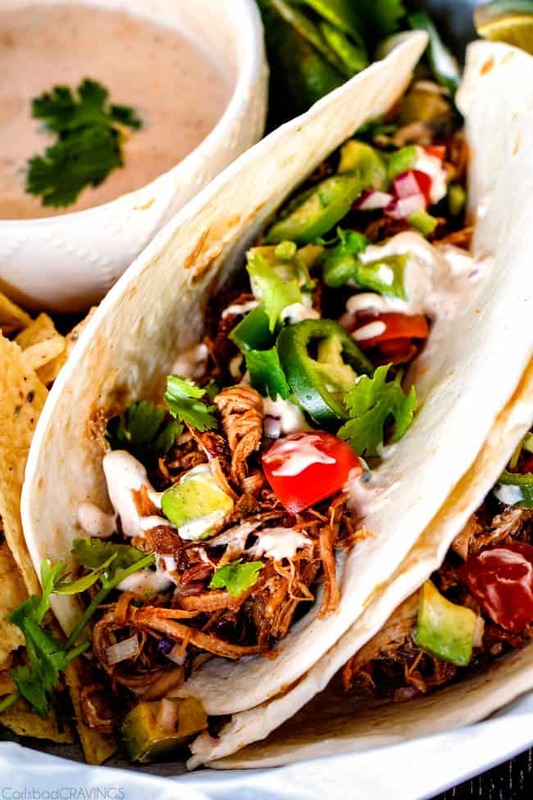 Your family and friends will thank you for making this Slow Cooker Pork Carnitas recipe again and again – think easy taco bar! 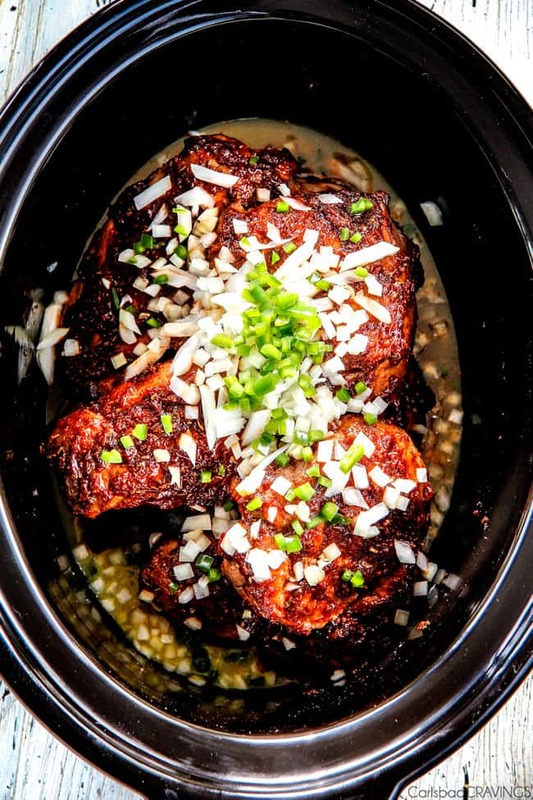 To make these restaurant quality Slow Cooker Pork Carnitas, first you sear the pork to seal in the juices, and caramelize the sugars in the meat. I also like to leave my pork in one large piece instead of chopping it smaller because the inside of the meat stays extra moist – not to mention its much easier to sear! Next, (once cool enough to handle), massage it with a wet spice rub of hand picked Mexican Spices as well as tomato paste, soy sauce and brown sugar. This Wet Spice Rub really sets this Carnitas Recipe apart from other versions as it infuses the meat with flavor (but not too much flavor), so it is eat-plain-delectable. Now it might seem a little counter intuitive to rub the meat with the Spice Rub after you sear it, but because this rub contains brown sugar, it can easily burn and blacken when seared. The Spices will still penetrate the meat, as it simmers in the bath of orange juice, lime juice, onions, garlic, jalapenos and liquid smoke for truly glorious Slow Cooker Pork Carnitas. The aforementioned liquid smoke also adds an undeniably smoky flavor that makes these Carnitas taste truly authentic. After your meat has cooked on LOW for 8-10 hours or on HIGH for 5-6 hours, its time get those edges nice and crispy! Please don’t skip this step otherwise you just have Slow Cooker Mexican Pork but NOT Pork Carnitas! There are a few schools of thought when it comes to getting the edges crispy. Some people fry up their shredded pork on the stove, which, while delicious, is more labor intensive and takes way too many batches for so much pork. I prefer the oven method. 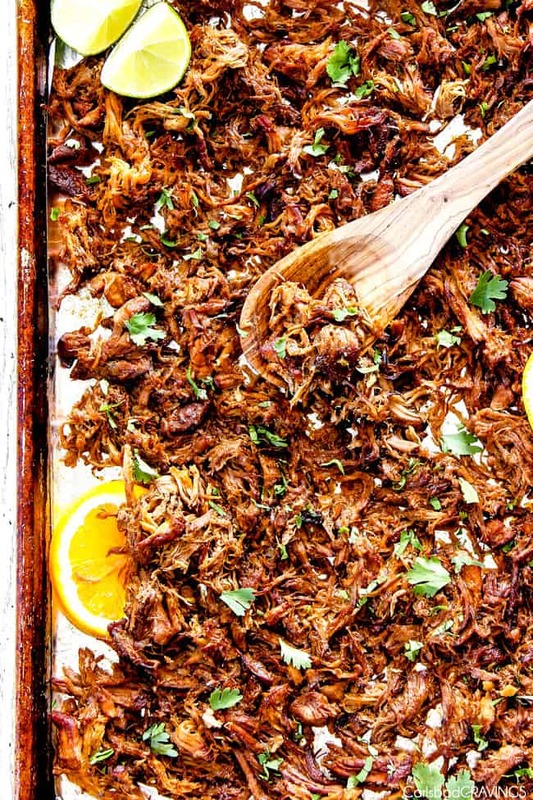 Simply line 2 baking sheets with foil, spread out your shredded pork, drizzle with some of the leftover seasoned slow cooking juices that are bursting with flavor and bake for 20 minutes. At this point your pork will start to crisp up in a few places but to finish it off, broil it to desired crispiness for an extra 5-10 minutes then drizzle with more scrumptious juices so it’s crispy AND juicy. 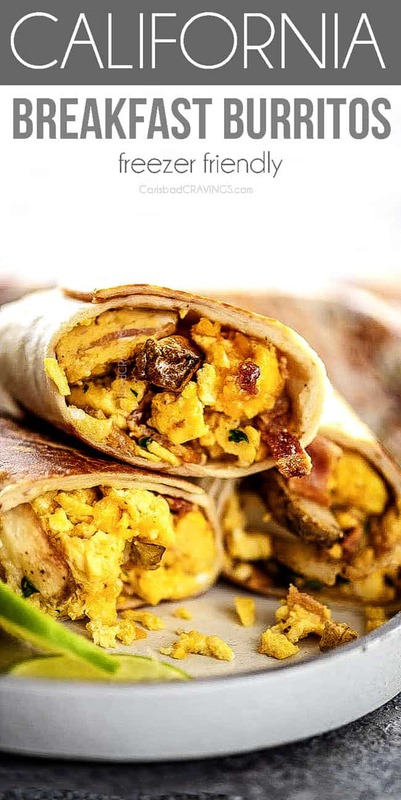 And either wrap in a warm tortilla smothered with your favorite toppings or pack on a plate with or stuff in ridiculously delicious Cheesy BBQ Pork Taquitos and savor the beauty of Carnitas without standing in front of a stove all day. It’s a beautiful thing. What Should I serve with Carnitas? Choose your favorite toppings and sides to transform these already fabulous carnitas into an epic meal! and top it all of with Churros! 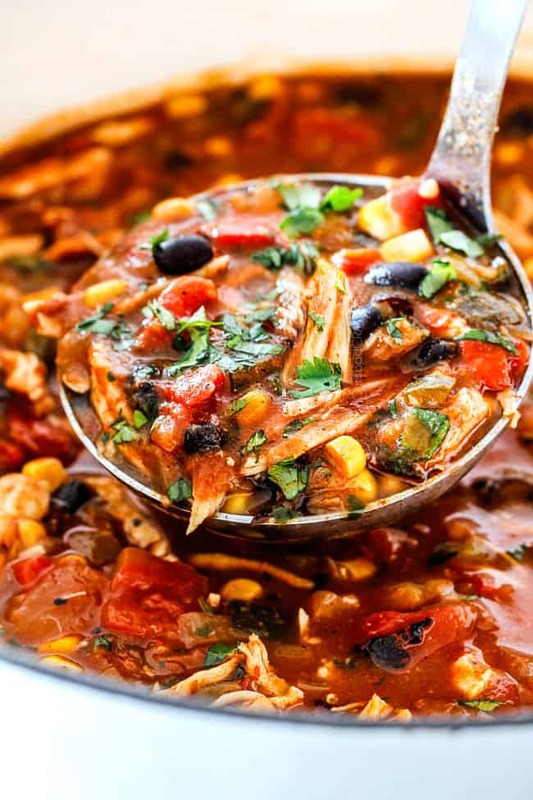 If you love Mexican food, you will also love these reader favorites Slow Cooker Mexican Chicken, Green Chile Chicken Enchiladas, Chili Lime Chicken Tacos, Southwest Salad, Blackened Fish Tacos, Cheesy Taco Soup, Chicken Fajitas, Baja Fish Tacos, Cilantro Lime Rice, and Smothered Chicken Burritos. 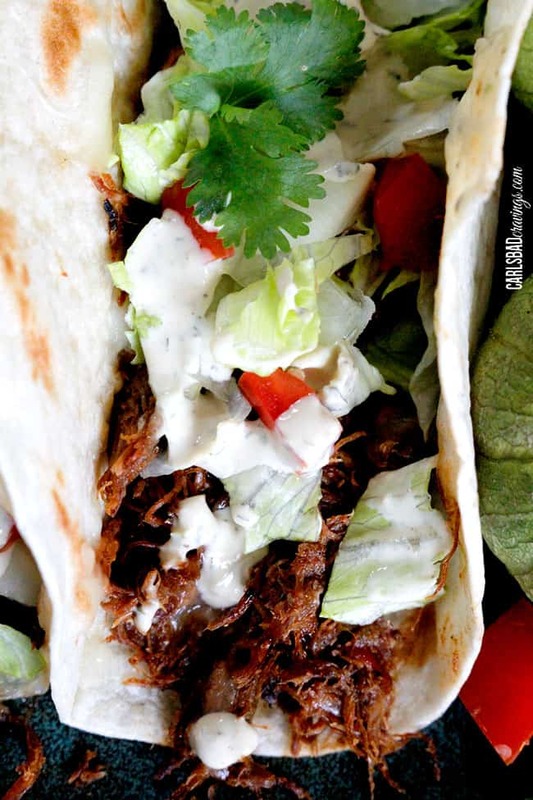 Want to try these Slow Cooker Pork Carnitas? 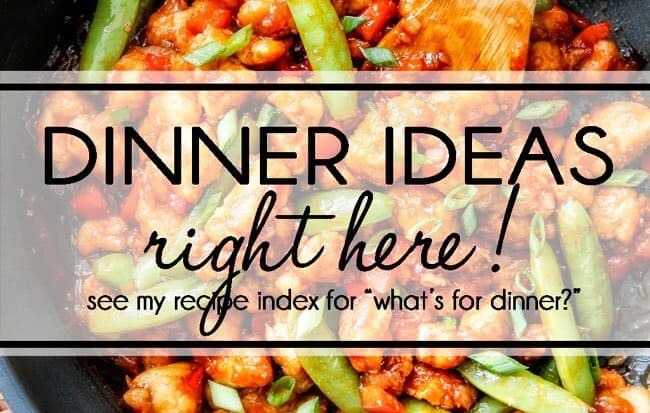 Pin it to your MEXICAN, SLOW COOKER, or DINNER Board to SAVE for later! 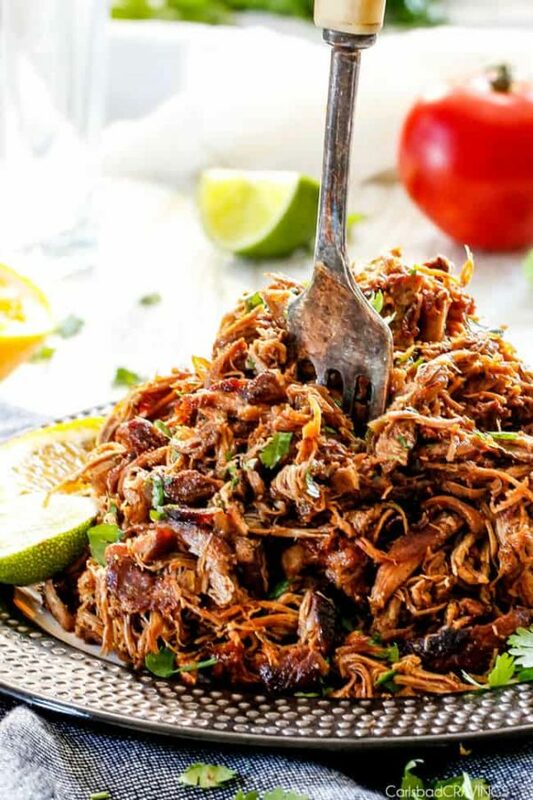 These are the BEST Pork Carnitas (Slow Cooker Mexican Pulled Pork) you will ever try! Or so say all the reviews! These Slow Cooker Carnitas are super juicy, easy and so much more flavorful than other versions complete with glorious caramelized crispy burnt ends! They are great for large crowds or make ahead meals and makes the best tacos, burritos, nachos, salads, etc! Heat 1 tablespoon olive oil over high heat in a large nonstick skillet. Using tongs or 2 forks, sear pork on all sides until lightly browned. Transfer pork to cutting board until cool enough to handle. Meanwhile, whisk together all of the Wet Spice Rub ingredients in a medium bowl. When pork is cool enough, massage Wet Spice Rub evenly all over then transfer pork to slow cooker. Add orange juice, lime juice, liquid smoke, and 2 bay leaves to slow cooker. Top pork with onions and jalapeno. Cook on LOW for 8 to 10 hours or on high for 5-6 hours OR until pork is fall apart tender and easily shreds with a fork. Remove pork from slow cooker to cutting board, shred, and add back to slow cooker and toss with juices. Cook on low for 20 minutes. Meanwhile, preheat oven to 450 degrees F. Line 2 baking sheets with foil. 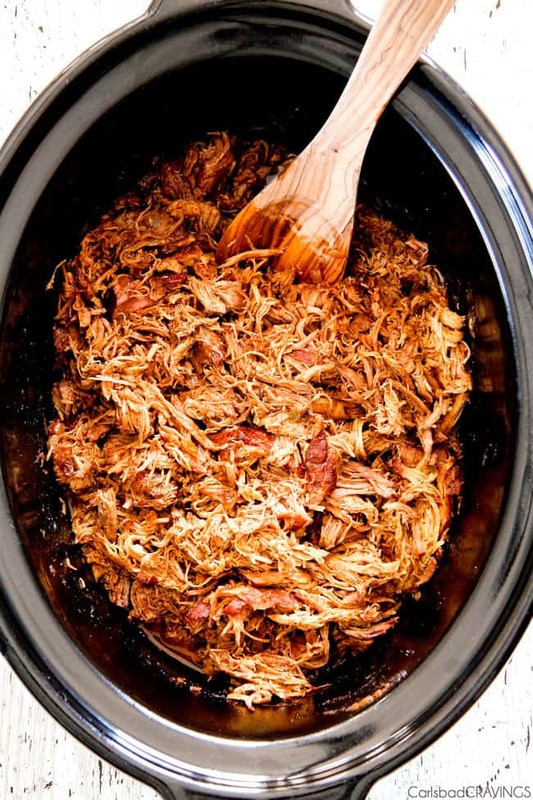 After 20 minutes, remove pork (do NOT discard juices in slow cooker) and add shredded pork to both baking sheets in an even layer. Drizzle with some of the remaining juices (about 1/4 cup) and bake for 15 minutes then broil to desired crispiness, watching closely so meat doesn’t burn (about 5-10 minutes). Drizzle with additional juices and toss. Serve warm in tortillas, on rice, salad, etc. with favorite toppings. This pork is a great springboard for several variations. For a saucy version, instead of broiling the pork, drain off excess juices then add (more or less to taste): 1/2 cup enchilada sauce, 1/4 cup salsa, 4 oz. green chilies and brown sugar and hot sauce to taste. **Liquid Smoke can be found next to the barbecue sauces in your grocery store and adds a wonderfully smokey flavor. *Try using leftovers in these amazing Cheesy BBQ Pork Taquitos! It looks like you use boneless pork shoulder. Would you recommend that over the bone in? Thanks! Hi Ashlie, you can also use bone-in, but you will want to account for the weight of the bone (approx 1 pound). Enjoy!